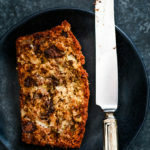 Not one, not two, not three, but FOUR bananas are packed into a single loaf of this Chocolate Chip Walnut Banana Bread. A bread absolutely bedazzled with chocolate chips and walnuts. Original content posted October 2014. Updated December 2018. 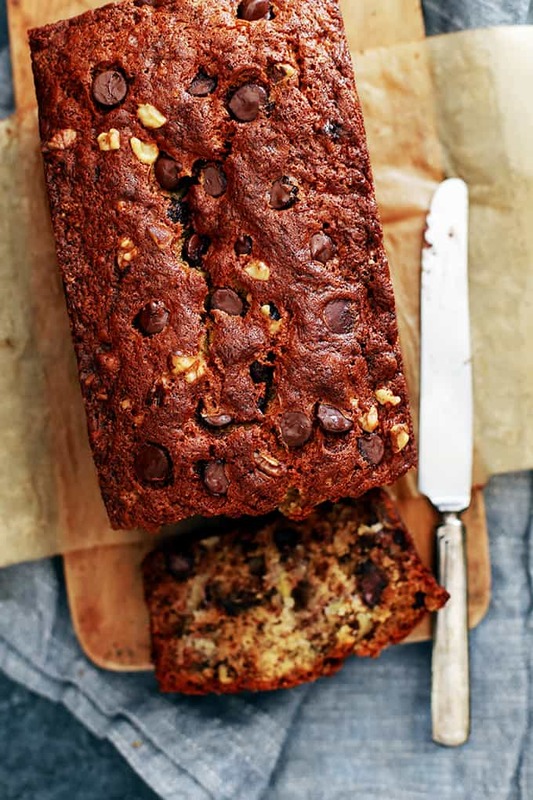 This Chocolate Chip Walnut Banana Bread is rich and decadent. Not one. Not two. Not three. FOUR bananas are packed into a single loaf of this delicious bread. That’s what gives it it’s beyond high moisture content. Just like any treat should be if you ask me! The fact that it has some bananas thrown in for good measure is just an added benefit. And because of said bananas, that means this is totally an appropriate breakfast food! Don’t you like how my mind works? I love adding bananas to baked goods. The flavor and moisture they add is just second to none! I mean, take a bite of my Banana Chocolate Chip Fluffernutter French Toast Casserole or Coconut Banana Bread Donuts and you’d be shaking your head in agreement in no time! And yes, I know, I know. Everyone says their banana bread is the best, but I’m here to set the record straight. THIS is the best banana bread recipe. I actually order large amounts of bananas to sit and turn an ugly shade of black in my fruit bowl just so I can make this Chocolate Chip Walnut Banana Bread. I don’t believe bananas ever truly go bad. For this banana bread recipe, the blacker a banana is, the better. Once they are black and start to shrivel a little bit, the sugars within the banana being to almost ferment. Using extra ripe bananas like this will make your bread extra delicious! 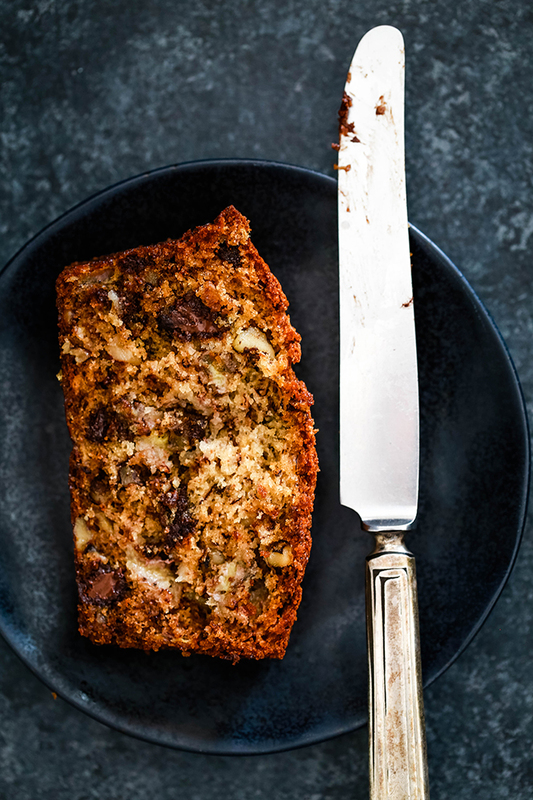 This Chocolate Chip Walnut Banana Bread has it all. 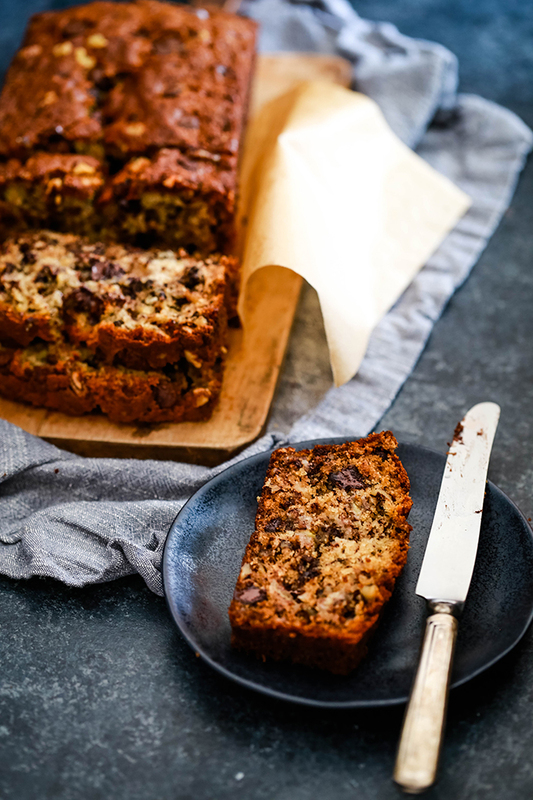 A moist and comforting banana bread base is bedazzled with chopped walnuts and chocolate chips. What emerges from the oven is nothing short of amazing. That melty chocolate gets me every time! I typically make two loafs at a time as the first is devoured so quickly. Or if you have more self-restraint that I do – kudos to you! – this bread also freezes beautifully. TIP: If you’re looking for an autumn take on this recipe, check out my Chocolate Chip Walnut Pumpkin Bread. 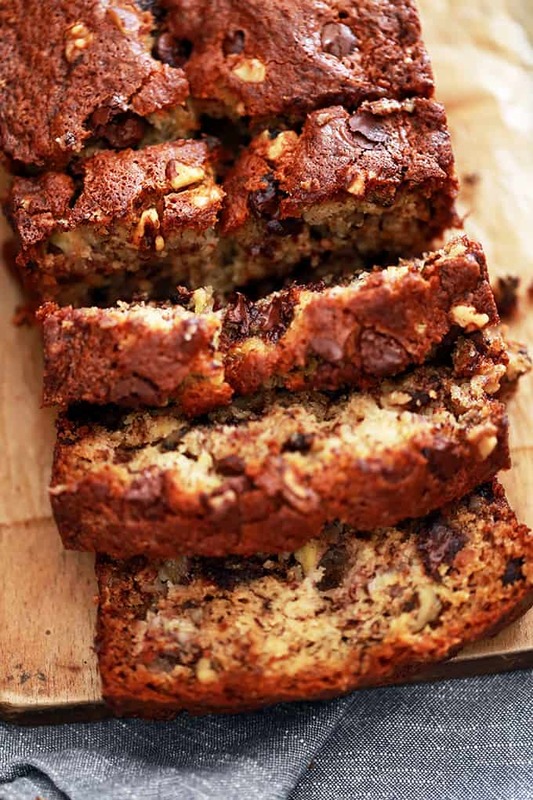 How to You Make Banana Bread with Walnuts and Chocolate Chips? In the bowl of an electric mixer, add butter and sugar. Cream together on medium speed until light and fluffy, about 3-4 minutes. Add eggs and bananas to mixing bowl. Mix on medium speed until combined. TIP: I like to leave some larger pieces of banana in my batter so that they’re visible and provide a punch of banana to the finished bread. Add flour, baking soda, salt and vanilla to mixing bowl. Mix on low speed until just combined. 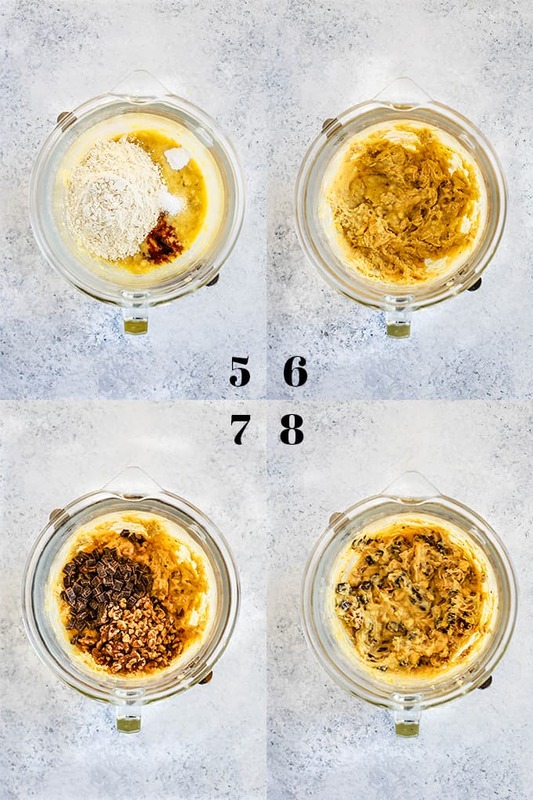 TIP: You want to mix only until the separate ingredients are barely visible as you’ll continue to stir to mix in the walnuts and chocolate chips in the next step. If you over mix the batter, it will result in a more dense and chewy bread. Add walnuts and chocolate chips to mixing bowl. With a spatula, fold in walnuts and chocolate chips until just combined. TIP: Folding is another name for very gently stirring that’s typically done with a rubber spatula until ingredients are just incorporated. The goal is to avoid deflating delicate ingredients by making broad, scoop-like movements from the inside of the bowl outwards. The more you handle the batter gently, the more tender your bread will be! Pour batter in a greased and parchment lined loaf pan and bake at 350 degrees for 55 minutes. Turn oven off and leave bread in oven for additional 15 minutes. TIP: To form a parchment paper sling for your bread, cut a length of parchment paper long enough to line the bottom of the pan with extra hanging over the sides. If your parchment is longer than your pan, fold the extra under. Press a crease in the parchment at the edges, so it fits snugly into the bottom. Spray non-stick cooking spray directly onto the bottom and sides of the pan and set the parchment on top. This will help the parchment stick to the pan, keep it from moving as you pour in the batter, and prevent batter from oozing between the parchment and the pan. 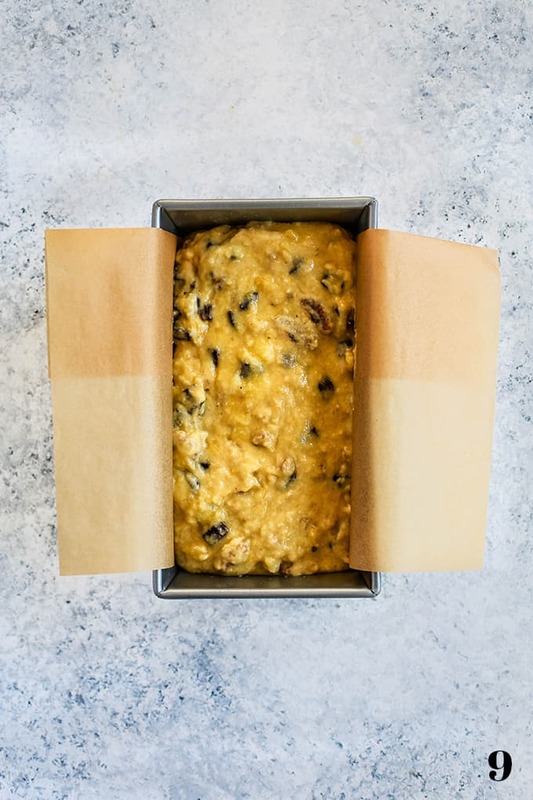 This Chocolate Chip Walnut Banana Bread should always be kept in plastic wrap, tin foil, or an airtight container to keep it from drying out. You can extend the life of your banana bread up to about a week by refrigerating it. I’ve also had great luck freezing loaves by wrapping tightly in foil and then placing in an air tight food storage bag. Then when you’re ready to enjoy it, you can simply place it in the fridge overnight to thaw. Bread loaves will keep in the freezer for three months. 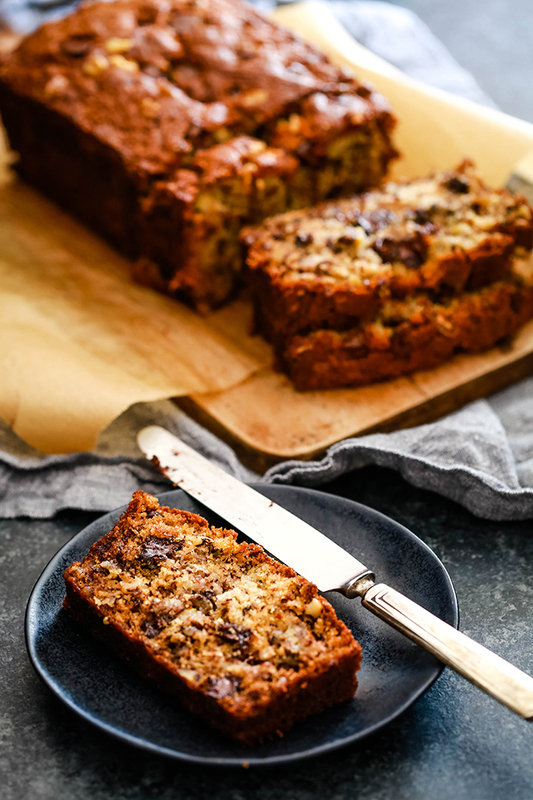 If you’ve tried this Chocolate Chip Walnut Banana Bread or any other recipe on Melanie Makes, please let me know your thoughts in the comments below. I love hearing from you and respond to each and every comment! 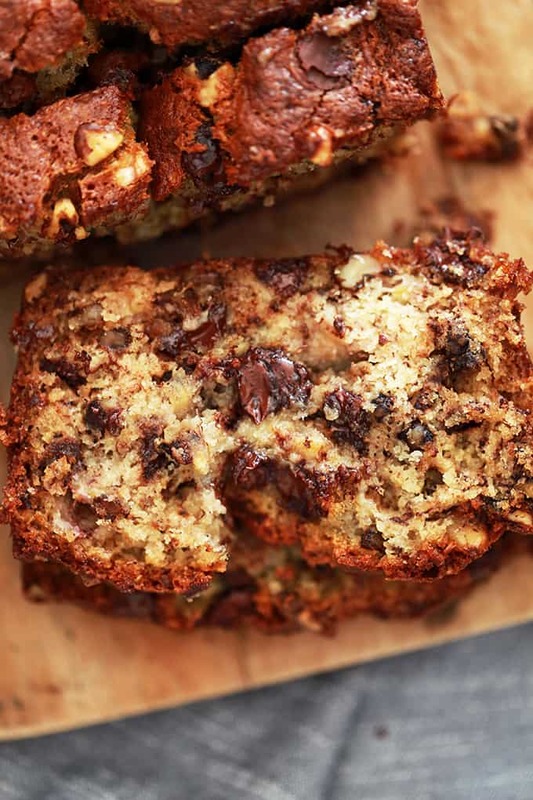 Not one, not two, not three, but FOUR bananas are packed into a single loaf of this Chocolate Chip Walnut Banana Bread. A bread absolutely bedazzled with chocolate chips and walnuts. In other words, I dare you to not fall in love with it upon first bite! In the bowl of an electric mixer, add butter and sugar. Cream together on medium speed until light and fluffy, about 3-4 minutes. Add eggs and bananas to mixing bowl. Mix on medium speed until combined. Add flour, baking soda, salt and vanilla to mixing bowl. Mix on low speed until just combined. Add walnuts and chocolate chips to mixing bowl. With a spatula, fold in walnuts and chocolate chips until just combined. Bake for 55 minutes. If beginning to brown to quickly, loosely tent with foil. Turn oven off and leave bread in oven for additional 15 minutes. Allow bread to cool for 10 minutes. Remove bread from loaf pan and allow to cool completely on a wire rack before removing from loaf pan to serve. 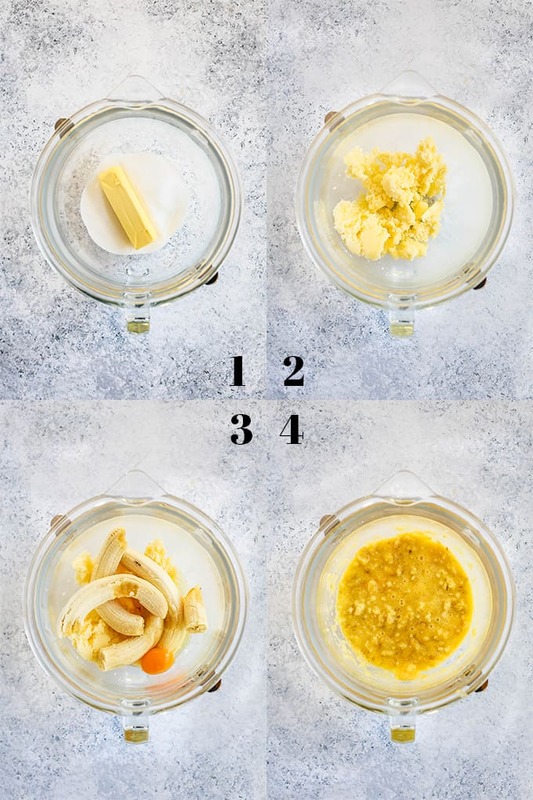 Looking for more delicious banana recipes? I have no doubt you’d love these insanely amazing Banana Nut Cinnamon Rolls, this old fashioned Homemade Banana Pudding or these super easy and delicious Copycat Trader Joes Gone Bananas. I love this recipe. My girls love this banana bread. It is simple and basic ingredients. Faith, you totally made my day! 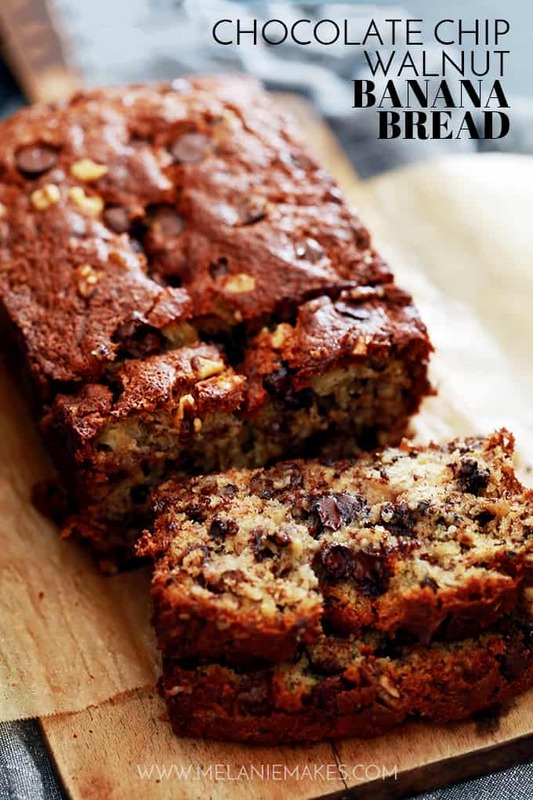 So glad that you and your girls love this banana bread as much as we do! I make this banana bread as a gift for my clients and my moms clients as well! Its amazing and everyone raves about it. I use over ripe bananas and store them in the freezer ready for my next bake! The best compliment one can get, Salemah - thank you! Love this recipe! It’s my go to whenever I’m craving some banana bread now. I’ve tried the recipe exactly the way it is and have added cinnamon sometimes, either way it’s delicious and moist. Thanks so much for sharing! 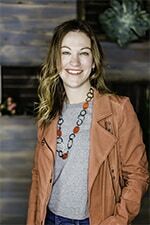 Love your addition of cinnamon, Sara! Thanks so much for your kind words and taking the time to let me know you enjoyed it! Hey Melanie,I tried this cake and it turned out awesome! I also need to make an eggless version of it so what can I substitute the eggs with? Hi, Kashish - thrilled you enjoyed it! I haven't made an eggless version but you might try substituting a flax egg and see if that works? Just made this hoping the kids would love it, even put two cups of choc chips in but no joy. It is absolutely delicious, I’m halfway through the loaf already, mine is quite greasy and wet on inside. Any ideas? Hi, Karen - So glad you enjoyed it! My kids go through a loaf so quick I always have to make two! I've never had a greasy loaf so I can't comment on that, but if it's still a little wet on the inside, you'll just want to leave it in the oven a bit longer after turning the heat off.